A person charged with drug possession could once again face between 20 years minimum and life in federal prison after a new policy memo from U.S. Attorney General Jeff Sessions. 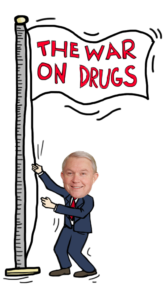 This memo, released on May 12, replaces two Obama-era policies that instructed federal prosecutors to avoid prosecuting low-level drug offenders. These policies, signed in 2013 and 2014 by then-Attorney General Eric Holder, reserved the strictest criminal charges, such as elongated prison sentences, for high-level traffickers and violent criminals. mandatory minimum sentences has dropped dramatically, and the federal prison population has declined by 14 percent, alleviating impacted federal prison populations and improving prison conditions. Under the new memo, prosecutors are instructed to, “charge and pursue the most serious, readily provable offense.” This could even affect mandatory minimum sentencing, which has long been regarded as a contributing factor to the U.S.’s bursting and discriminatory prison systems. Although all races sell and use drugs at a similar rate, people of color are far more likely to be stopped, searched, arrested, prosecuted, convicted and incarcerated for drug law violations. Black people are 3.7 times more likely to be arrested for marijuana possession than white people.Black people also serve almost as much time in federal prison for drug offenses as white people do for violent offenses. This is because low-income neighborhoods in urban core areas are disproportionately targeted by police in searches for drug offenders and people of color receive biased treatment by prosecutors and the entire criminal justice system. During the war on drugs and the cocaine surge of the 1980s, drugs were seen as moral failings that needed to be violently policed. The crack cocaine epidemic struck Black people from low-income backgrounds the hardest, but a similar drug epidemic emerging in 2015 had a different pattern. White drug users addicted to opioids were characterized by the media as victims who needed compassion. Their drug use was seen as a public health problem and many offenders received lower-level convictions — such as community service and rehabilitation — instead of incarceration. The data is clear — the justice system disproportionately incarcerates people of color. Reforming the criminal justice system is slowly becoming a more popular position for politicians. Both sides of the aisle are finally beginning to recognize the failings of decades of tough-on-crime policies that blatantly perpetuate systems of oppression and criminalize substance abuse, particularly among people of color.